We’ve seen old airplanes recycled into hotels, homes, and restaurants, but Paul Coudamy is taking things piece by piece with his incredible F-light. 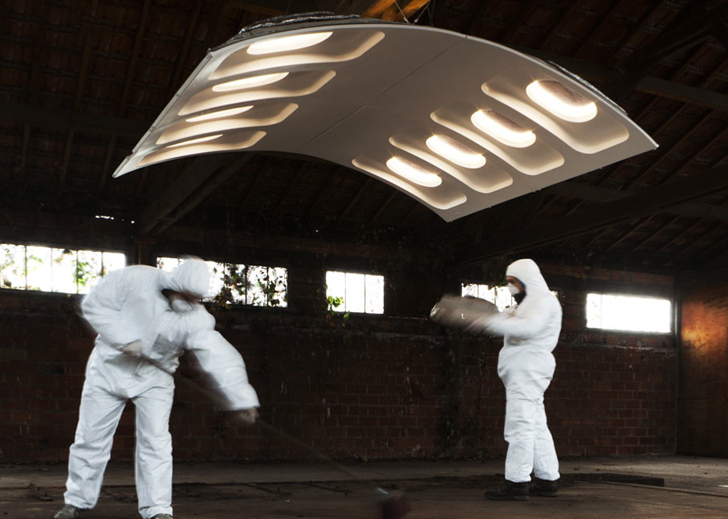 The designer has transformed the walls of an old Airbus A300 into a luminous hanging lamp that is sure to take command of any office. Coudamy’s design uses the natural curvature of the decommissioned Airbus’ cabin walls and windows to create the arcing hanging lamp. The resulting piece hugs the interiors in which is hangs, creating a warm and comforting glow. The F-Light is inlayed with a dual lighting system for both direct and ambient lighting. A layer of inset lights radiate from the silver interior insulation of the cabin wall. Each of the cabin windows is also illuminated with a backlit halo that emulates the sun pouring into the cabin from cruising altitude. The arch concentrates the lighting to the area below- perfect for a communal table or board meeting. The individual shades have been left on the windows, allowing the intensity of light to be adjusted. The aerodynamic curves, which once navigated the skies, are transformed into an object of high design so that their curvature can be appreciated by a new audience. 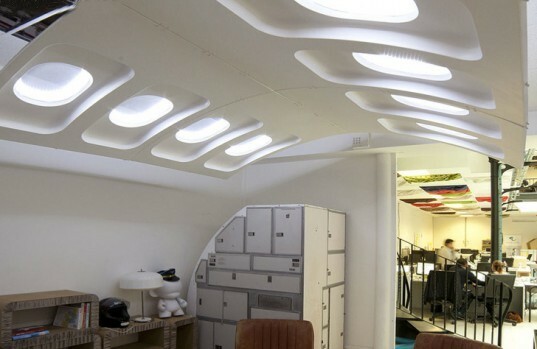 The F-Light, designed for FLOWN Mobilier Airlines, takes the airway’s retired 20-year-old aircraft and gives them new life indoors. The lamps, although not commercially available, are listed for purchase upon request.